THE SHORIN-RYU KARATE ACADEMY DEMO TEAM! The Shorin-Ryu Karate Academy Demo Team started in late July 2001. Originally there were four of us. Allie Boyd, Derek Gendron, Dan Gonzalez, and Kerri Doherty. Nick Katcher join a few days later. Kerri left in late August for school reasons which left the four of us to be a team, which we have been ever since. In late March 2002 we started a Jr. Demo Team to perform as an opening act for us and as a stepping stone to eventually join the Demo Team. The four members are Luke McDowell, Emily McDonaugh, John Vogel, and Danny O'Brian. We have had our ups and downs while being a team. But we always came through. To date we have had eight demos. The Jr. Demo Team has had three demos. Copyright (c) 2002 by Dan Gonzalez, student, Shorin-Ryu Karate Academy of Waltham. The ASKA is a non-profit 501 (c) 3 organization. 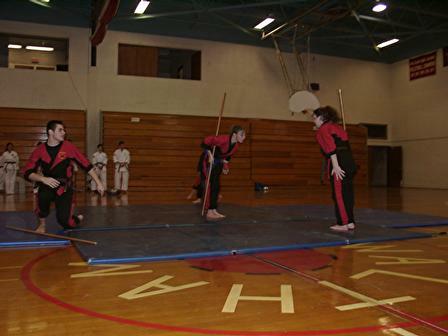 Disclaimer: The views of the Shorin-Ryu Karate Academy Demo Team are not necessarily the views of the Shorin-Ryu Karate Academy of Waltham or the ASKA. The ASKA and The Shorin-Ryu Karate Academy of Waltham is in no way responsible for the content of the Shorin-Ryu Karate Academy Demo Team home page. Pictures copyright (c) Stephen Iannetti.